"The many-fingered time formulation of quantum field theory provides a Schrodinger-like equation that does not involve a preferred foliation of spacetime." 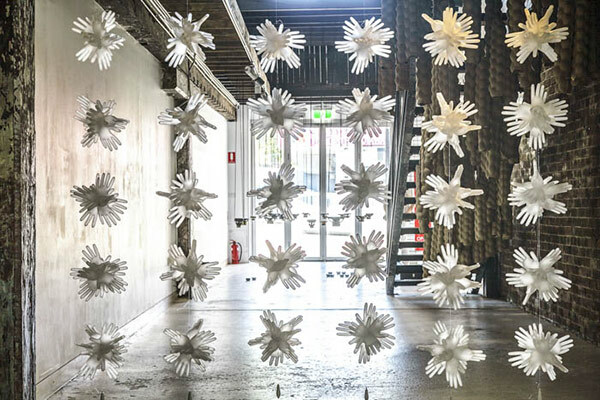 In 2014, Ferracin created without gravity, an immersive installation using laboriously torn and tied strips of colourless plastic bags, static electricity and projected light. Visitors entered a small white room filled with densely clustered tendrils of plastic hanging from ceiling to floor. Their presence caused the filaments to arc and move in charged sympathy - the art work reaching out to touch the viewer, inverting the usual ‘do not touch’ instruction, converting the experience of Art from detached observation to like-it-or-not delicate engagement. 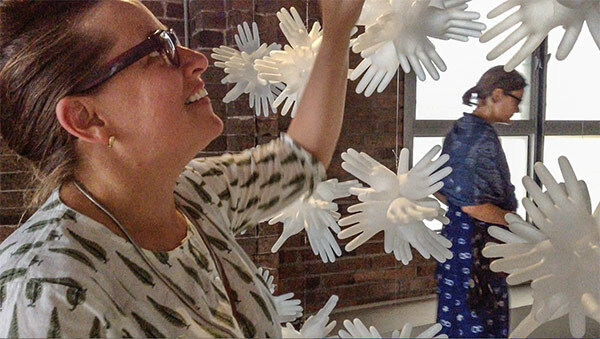 The site-specific soft sculpture interlude (kinetic) continues this transformative exploration of mass-produced mundane materials, this time deploying hundreds of disposable latex gloves inflated with exhaled breath, carbon dioxide, a waste product and proof of life of every human existence. The sculpture creates a delineation in the project space, a threshold experience that visitors must navigate, push through, to reach the other works in the show. Its breath-filled fingers poke, caress, rake the skin, hair and clothes of visitors. Their movements transfer energy to the sculpture, causing it to sway like skeins of seaweed in oceanic currents. 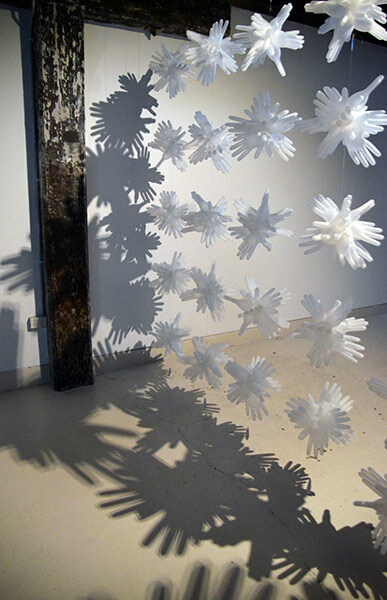 Over time, the captured breath inevitably leaks from the softly uncanny hand-shaped containers. The second-skin topology softens further, deflates, transforms, wrinkles, dies back.